“This Is What a Preacher Looks Like” was a hit catchphrase long before any idea of a book ever existed. When Baptist Women in Ministry created T-shirts to celebrate their 25th anniversary, few could have predicted how popular the bright aqua-colored shirts would become! Yet, no one should be surprised about the giftedness of Baptist women preachers. From the first days of Baptist beginnings—as early as the 1630s—Baptist women preached throughout England. Their voices are soft and loud, prophetic and pastoral, humorous and sincere. They are African American, Asian, Latina, and Caucasian. They are sisters, wives, mothers, grandmothers, aunts, and friends. 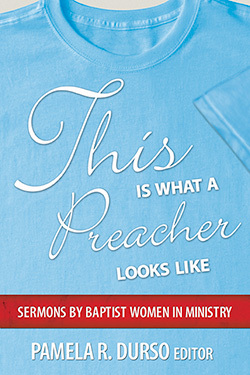 This Is What a Preacher Looks Like: Sermons by Baptist Women in Ministry is a collection of sermons by thirty-six Baptist women. Just imagine—the work of thirty-six Baptist women preachers in one volume. Yet, the truth is that this book could have contained sermons by 836 Baptist women, all preaching the word of God! Pamela R. Durso is executive director of Baptist Women in Ministry in Atlanta, Georgia, and is an adjunct professor at McAfee School of Theology. She received her Ph.D. in church history from Baylor University. As mother to Michael and Alex, she is discovering with her husband, Keith, the adventures of parenting teenagers. She likes researching and writing history, especially the history of Baptist women, but she loves sitting down with a cup of coffee and listening to people’s stories. Inside What a Preacher Looks Like you will find what a sermon sounds like when a sermon is mindful, thoughtful, prayerful and truthful. The fact that all of these sermons are from preachers who are women is, on the one hand, a reminder of all we have missed when the church has tried to tell God who God can and cannot call to preach. 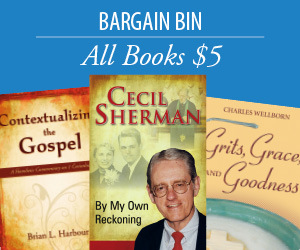 On the other hand, this collection of sermons is a powerful reminder that God does what the Bible says God does; pour out the Spirit of proclamation on sons and daughters with no regard for whether they happen to be sons or daughters. Wouldn’t you love to attend a preaching conference to hear thirty-six of the best Baptist women ministers? You could be moved by sermons from pastors, church staff members, campus ministers, denominational leaders and theological educators. This is What a Preacher Looks Like is just such a joy without the airfare. This beautiful collection literally sings with the energy of the spirit. An important tribute to the power women bring to the word. Amen sisters! Pam Robinson Durso has been opening my eyes since we were religion majors together at Baylor University. She was my friend, and she was the first woman I knew who was preparing herself for ministry. This in a day when people would say to her, “You’re going to seminary? Why?” Baptist women ministers, by virtue of their gender, are called to open our eyes. This collection of sermons will open the eyes of conservatives who don’t think women should preach, and moderates who think women preaching is a new thing. As it turns out, women have always been preachers, ever since a stunned woman proclaimed “He has risen,” on the first Easter Sunday. You hold in your hands words from that woman’s sisters in the faith. Read them and know that it has always been this way.